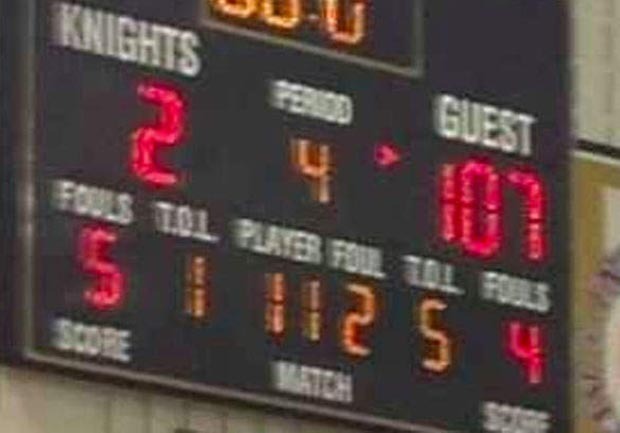 INDIANAPOLIS A girls' high school basketball game blowout got a lot of attention Tuesday night and Wednesday morning, CBS affiliate WISH reports. Bloomington South's girls' basketball team defeated Arlington 107-2 Tuesday night, and many took to Twitter to comment on the score. ESPN reported on the blowout win and some tweeted photos of the scoreboard. RTV6 in Indianapolis reported that Arlington scored only on free throws in the second and third quarters. The station said coach Larry Winters said all nine members of Bloomington South's team received playing time. The blowout did not sit well with Arlington coach Ebony Jackson. "No, it's not OK but (Winters) will have to live with that," Jackson told the Indianapolis Star. "If that's how they want to carry themselves, that's fine. I'm focused on me and mine and we'll just keep going." Chris Kaufmam with the Indiana High School Athletic Association says blowout games like the one between Bloomington South and Arlington happen rarely. "It's not something we like to see," Kaufmam said. Current IHSAA rules prohibit teams from forfeiting games and the IHSAA has no "mercy" rule on the books. Kaufman says neither school has called to file a complaint about Tuesday night's blowout.